Father Maximilian Kolbe is a Saint! – Such was the proclamation by Pope Saint John Paul II on October 10, 1982, followed by the tolling of the bells of St. Peter’s Basilica in exultation of the martyr of Auschwitz! 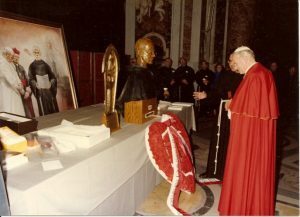 Met by the thunderous applause of thousands in attendance, including some of the surviving prisoners of the Nazi concentration camp – whose minds and hearts are forever branded with the memory of his saintly and heroic self-donation – their former cellmate had now been raised to the Altars of the Church! Once again, Christ reigns! Once again the enemy has been defeated! Tracing back, however, to the inhumanity of World War II, where a shattering sense of hopelessness pervaded the death camps as the Nazis took over Poland, this place of infamy became the Calvary of the modern times. Anger and hatred filled the heart of every prisoner until one stepped forward from the prisoners of Block 14, among whom ten had been singled out in retribution for one escapee. 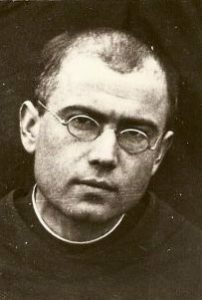 Not initially selected, this obscure man – Father Maximilian Kolbe, a Catholic priest – voluntarily took the place of one of the ten, the father of a family, who, along with the others prisoners, had been sentenced to death by starvation. Following the canonization Mass, the Holy Father emerged from St. Peter’s Basilica with his concelebrants, all garbed in red vestments, publicly proclaiming the Servant of God a martyr: a martyr of faith animated by love: “Greater love has no man than this that a man lay down his life for his friends” (Jn 15:12). That love, which is so very dear to the Franciscan life, was the summary of the life of St. Francis, the Poverello of Assisi. For this very reason, Pope Paul VI had called Blessed Maximilian the “St. Francis of our times” during his beatification ceremony some years earlier, on October 19, 1971. Saints are not born, they are made. A careful look at Maximilian Kolbe’s early years indicates some of the factors that led him to the summit of heroic love and transformation into the image of Christ. Born on January 8, 1894, in Zduńska-Wola, Poland, Maximilian lamented the existence of hatred and the political split in Poland. His father Julius Kolbe, a working class citizen, struggled under the effects of this disunity, where the bonds of love and understanding did not prevail among the citizens of Poland, largely due to the occupation of Russia, Prussia, and Austria. His three sons Francis, Raymond (who was later named Maximilian in his religious Order), and Joseph, would experience the same social consequences. As a child, Raymond dreamed the political reunification of their Motherland would come about through the valorous efforts of some knights of Our Lady of Czestochowa. His courageous and generous soul to undertake great things for his country was intensified by his ardent devotion to the glorious Patroness of Poland. This special dedication to the Mother of God could easily be attributed to the influence of his own virtuous mother, Maria Dabrowska, who formed his early years in the daily recitation of the Angelus, the Holy Rosary, and the Litany to Our Lady. The practice of these pious Marian devotions, however, would not subdue young Raymond’s natural, mischievous nature. At some point, when the youngster was finally reprimanded by his mother, she raised the question as to what would become of him if he continued his naughty behavior. Tearfully, he presented himself before the Blessed Virgin Mary and humbly asked her the same question of himself. In response, Our Lady showed him two crowns: one red, the other white. When asked to choose which he preferred, he chose both: to remain pure and undivided in his love for God and the Blessed Virgin, and to be a martyr. Only a saint can make such a generous choice! Saints are the ones who desire to do astounding things for God! Saints have magnanimous ambition, not because they trust in themselves, but because they are urged on by a profound and unbounded love. At age thirteen, Raymond Kolbe became fascinated by the Franciscan ideals preached by two Conventual Franciscans who conducted a parish mission at his church in Pabianice in 1907. Soon thereafter, he and his elder brother, Francis, entered the Franciscan minor seminary in Lwów. During his formation and study there, the makings of a saint continued to deepen. He fervently sought to draw profit from all the means accessible for his personal sanctification. He took diligent care to assimilate the instructions he received and to put them into immediate action. Never did he shun occasions to make sacrifices and to vigorously uproot all that was inordinate in his being. Prayer, therefore, was the mainstay of his passionate soul, deriving great benefit from his many hours before the Blessed Sacrament. But most of all, he nourished a tender and profound love for the Blessed Virgin Mary whose devotion is at the very heart of Franciscan life as the inseparable reality of its Christ-centeredness. 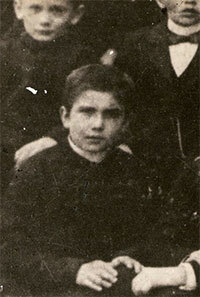 On September 4, 1910, Raymond Kolbe entered the novitiate of the Conventual Franciscans. Being invested with the Franciscan habit, he was given the new name of “Friar Maximilian Mary.” Just as most saints, Friar Maximilian also underwent countless trials and tribulations; he had scruples and doubts during his years of formation. The largesse of his soul, however, compelled him to do great things for Our Lady, pressing him on to leave the Order and join the military forces in defense of Poland, his Motherland, under Mary’s patronage. It was proven, however, that God’s plan for him was of a different military nature, and he finally came to understand that his mission was to be fought on the spiritual battlefield. Having been sent to Rome to further his theological studies, his magnanimous soul found its expression in the intensity of his love for the Immaculate! His Franciscan formation augmented his thirst for the Christ-centeredness of the Order’s spirituality and its theological bent, with emphasis on the Primacy of Christ. On the devotional level, this Primacy is equated to the triumph of the Most Sacred Heart of Jesus. Such emphasis on Christ’s power and redemptive love finds its most perfect fulfillment in the Immaculate; and Friar Maximilian gradually discovered that in order to be a saint, one must be conformed to the likeness of Christ, a likeness which is authenticated in the perfection of the Immaculate. But to be a saint demands a total response to love, made possible only through the help of grace. Mary, being the Immaculate, i.e., full of grace, mediates these graces from God through her spousal bond with the Holy Spirit. This Franciscan intellectual tradition influenced St. Maximilian in founding a movement which had its underlying dogmatic truth on Mary’s role in the economy of man’s sanctification and salvation – a role that ultimately leads one to the fastest, easiest and surest way of becoming like Jesus. Having obtained permission from his superiors at the Conventual Franciscan Collegio-Serafico in Rome, this movement, named the “Knights of the Immaculate” (“MILITIA IMMACULATAE” or “M.I.”), was founded on the eve of October 16, 1917, a year before Friar Maximilian’s ordination. Along with six other friars, he consecrated himself totally to the Immaculate and drafted the simple M.I. Statutes of this Marian-Franciscan movement. Even to this very day, its goal continues to be the sanctification of as many souls as possible under the patronage of the Blessed Virgin Mary. When he returned to Poland as a young priest in 1919, he was appointed professor to the Franciscan seminarians in Cracow. However, because of his failing health and having contracted tuberculosis, he was deemed unsuitable for the task. His superiors, therefore, decided to assign him to the office of confessor. Far from helping his already weakened condition, he became increasingly frail, and was subsequently consigned to the sanitarium of Zakopane. But his zeal for souls, characteristic of a true saint, did not diminish because of his physical ailments. He provided various spiritual services among his sick companions and instilled in them the love of Our Lady. After having recovered from a long confinement – which served as a period of silence and purification for him – he was prepared to launch a new apostolic endeavor, the likes of which had never before been seen in Poland, or in the world: the City of the Immaculate (Niepokalanów). 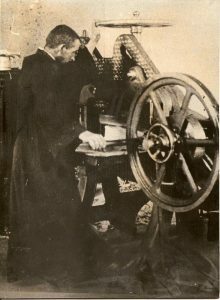 It all started in the humble surroundings of the friary in Grodno where Father Maximilian established a printery for the purpose of promoting devotion to the Immaculate. 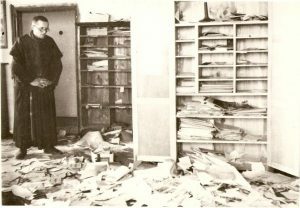 However, the growing number of subscribers to his printing apostolate forced the friars to transfer their location to donated land in Warsaw in 1927, and is where Father Maximilian established the first City of the Immaculate. It was called “city” because the friars numbered almost eight hundred, all working for the Immaculate with the huge mass media apostolate. They lived heroic lives of poverty, continuous prayer, and voluntary penance. They were united in their mission of evangelizing not only Poland, but the whole world! Day and night, the friars spent themselves in promoting Catholic doctrines, particularly those concerning Our Blessed Lady. They did all this in view of cultivating the need for conversion and sanctification of souls, both on the individual and collective levels, via the mediation of the Blessed Virgin Mary. 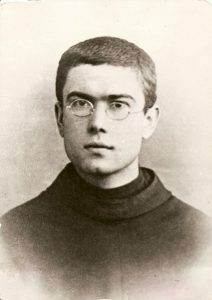 For Father Maximilian Kolbe, sanctification always necessitated the mediation of Mary because, for him, only through her and by means of her, the Holy Spirit, the Sanctifier of souls, acts in an inseparable way in each individual soul… whether or not that soul acknowledges Mary’s role in this process. But as he explained, the more a soul acknowledges and is conscious of Mary’s important role in the economy of salvation – the surer, easier and faster that soul can become a saint via consecration to her. Since, unfortunately, there are so few of the faithful who are aware of this wonderful “elevator” to sanctify souls, namely Our Lady ─ there are still fewer working to make her better known and loved. This was the ever-consuming theological and spiritual focus of Kolbe’s apostolic enterprise and, therefore, his reason for launching this work for the cause of the Immaculate, using every possible licit means. Apart from his principal publication, the monthly magazine “Rycerz Niepokalanej” (“Knight of the Immaculate”) that reached its peak of 600,000 copies per issue, he also printed a daily newspaper, the “Maly Dziennik,“ which eventually reached a circulation of one million. 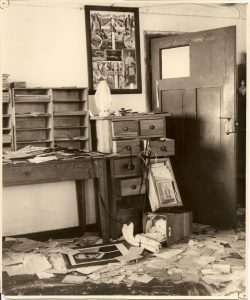 Miscellaneous books, magazines, and pamphlets for people in all walks of life were freely circulated by the friars. What could possibly be the secret of the incredible progress of Kolbe’s work? He himself pointed out to the friars that the true progress of Niepokalanów does not actually consist in constructing more buildings, of adding more printing presses, or of publications becoming more widespread. It consists, rather, in the daily deepening of one’s love for the Immaculate. The success of the work is brought about by Mary’s mediation and assistance. She – seeing the profound love of a soul for her – would eventually reward such love by loving that soul in return; thus generating the fruit of these two loves (i.e., the soul’s and the Immaculate’s): the birth of Jesus in countless souls. This is Kolbe’s dynamic principle of action and reaction. A saint’s heart can never be constrained to geographical boundaries. He is, by grace, always a missionary. This was especially true of St. Maximilian Kolbe. He loved the Immaculate with the Heart of Jesus, and he loved Jesus with the heart of Mary. It is manifested in a similar, universal desire to win all souls to Jesus and the Immaculate. He wrought numerous conversions among the Japanese; most of them thanked him for his heroic and unconditional sacrifice to draw them to the true Faith. But St. Maximilian recognized that this apostolic success could only be attributed to a pure and undivided love for the Immaculate. Where there is love and charity, there is God. After having initiated the undertaking and seeing it flourish in Japan, his major superiors appointed him as the superior of the Polish City of the Immaculate whose apostolic potentials had peaked at that moment in time. Upon his return to Poland, with somewhat of a prophetic “instinct,” knowing perhaps his end was approaching, he busied himself giving continuous and regular spiritual conferences to the friars, so as to consolidate his spiritual and apostolic legacy. Such preparation became the spiritual strength of the friars themselves. Shortly afterwards, the Nazis occupied Poland in September, 1939. 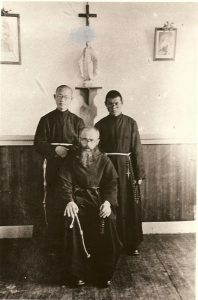 Father Maximilian and many of the friars were arrested. Their incarceration lasted approximately two months. Upon his release from prison on December 8, 1939, the feast day of the Immaculate Conception of his Heavenly Queen, Father Maximilian returned to a ransacked Niepokalanów. The Nazis suppressed his printing and publishing apostolate. Without being disheartened, his zeal remained unabated. Due to the harsh war conditions of the time, Niepokalanów was quickly turned into a refugee center for displaced families, Jews and victims of political unrest. His solicitude for these war victims had no sectarian boundaries; he fostered in them the need to forgive their enemies, and to acknowledge that hatred is destructive and love alone is creative. On February 17, 1941, Father Maximilian was arrested by the Nazis for a second time. Only hours before the Gestapo arrived, he completed his final and most comprehensive, theological essay on the Virgin Mary’s identity as one who is perfectly united to the Holy Spirit by a bond of love. Soon after, in the concentration camp, Father Maximilian would translate his theological and spiritual insights into practical words and actions for his fellow inmates, by tangibly showing that there is God, and therefore, love and hope exist even in the midst of horrific genocide in the camps of Auschwitz. Only a saint can stand firm, with constancy and unwavering hope, throughout life’s many difficulties and sufferings. Only a saint can influence others to do the same, because only a saint knows that true and perfect peace is found in God alone. For the saint, trials don’t weaken, they fortify. Serenity and calmness amidst atrocities are not a sign of defeat but of victory, for love is greater than hatred! In July of 1941, it was reported to the deputy camp commander that a prisoner from St. Maximilian’s barracks had escaped. In order to set an example, and to prevent further escapes, the standard procedure was to have the commander of the barracks single out ten men for the starvation bunker. Father Maximilian, although not among the ten first selected, volunteered, in a heroic act of charity, to be the victim in place of a prisoner who cried out: “My poor wife; my poor children!” The result of this self-offering was that Father Maximilian would be assigned to the infamous starvation bunker where he would slowly but surely die. At this precise moment, the victim Saint attained full conformity to the Victim of the Cross; for there is “no greater love than this, that a man lays down his life for his friend” (Jn 15:12).